GRAND RAPIDS, Mich. — And then there were two. 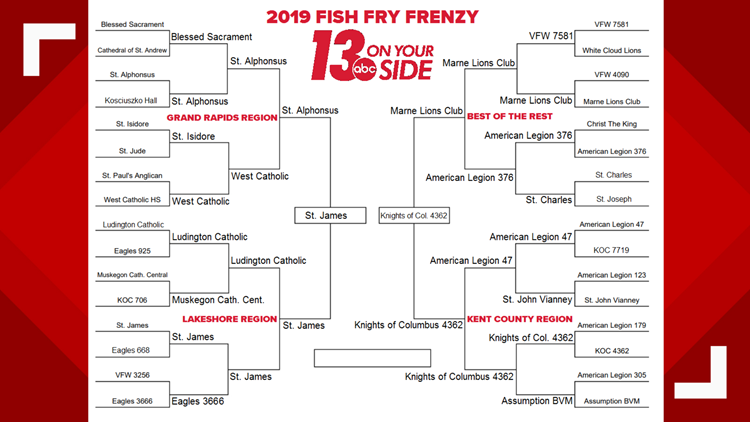 For nearly a month now, 13 ON YOUR SIDE has been narrowing down a list of 32 fish fries to determine which one is the best of all. Last week, St. James Catholic Church in Montague beat out St. Alphonsus Church in Grand Rapids. The Wyoming Knights of Columbus defeated the Marne Lions Clubs. Now the Knights of Columbus and St. James square off, because there can only be one champion! You'll have until Tuesday, April 16 at 11:59 p.m. to vote below. You can vote up to once per day. On Wednesday, April 17, we'll announce the winner on 13 ON YOUR SIDE Mornings! If you don't see your fish fry listed in the bracket, feel free to add it to our interactive fish fry map.